Cats and dogs do not sweat, therefore they must increase their respiratory rate to dispel the excess heat via their mouth (panting). When an animal cannot pant fast enough to cool down, the body temperature will rise to a dangerous level causing heat exhaustion / heat stroke . Get the animal out the heat. Put lukewarm water on the fur and allow the animal to cool down. Do not put ice directly on the skin as it will cause the blood cells to constrict causing further damage. Soak a towel in cold water and apply this to the animal’s head, groin, paws and back. This will have a cooling effect. Offer him cool water to drink to prevent dehydration. Do not allow him to drink excessive amounts of water as this will cause vomiting. Monitor the temperature as you do not want the reverse effect and cause hypothermia (too cold). This is a very dangerous situation and the animal may die if not attended to quickly! Occasionally owners take their pets with them in the motor car. 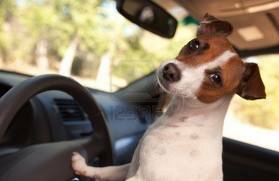 It very dangerous for an animal to be left unattended in the vehicle. Leaving the windows open a little is definitely not acceptable as the heat in the vehicle can reach very dangerous levels within 10 minutes! Heatstroke may develop within 15 minutes!! In the event of heat exhaustion - transport in the car with the air conditioner turned on. Try to keep the animal in a sitting or standing position. Assist if he is unable to sit or stand on his own. The reason is to prevent the blood from pooling causing blood clots due to coagulation. TRANSPORT THE ANIMAL TO THE NEAREST VETERINARY CLINIC! If there are any suggestions or topics you would like to have included – please contact me. WE PROMOTE RESPONSIBLE CARE FOR ALL ANIMALS.